You may be surprised to know that there are about 110 different gerbil species. The most common gerbil kept in captivity is the Mongolian gerbil, which is the species we are going to focus on this month. The Mongolian gerbil’s Latin name (Meriones unguiculatus) loosely translates into “clawed warrior” and is related to the gerbil’s storied connection to the founder of the Mongolian empire, Genghis Khan. According to legend, an assassin broke into Genghis Khan’s sleeping quarters one night. A wild Mongolian gerbil who was also in the room bit the assassin’s foot, causing the assassin to yell and wake Genghis Khan who killed the intruder. In the wild, Mongolian gerbils live in semi-desert and the dry steppes (open grasslands) of Mongolia and in neighbouring areas of China and Russia. Mongolian gerbils are hardy rodents as they live in extreme conditions in the wild, with climates ranging from 50 degrees Celsius in the summer to –40 degrees Celsius in the winter. A benefit to living in a harsh environment in the wild means the Mongolian gerbil doesn’t have many natural enemies as few animals can live under the same circumstances. The major predators of Mongolian gerbils are humans, snakes and birds of prey. If a predator is detected, frightened Mongolian gerbils will drum their feet to communicate to other gerbils that a predator is nearby. 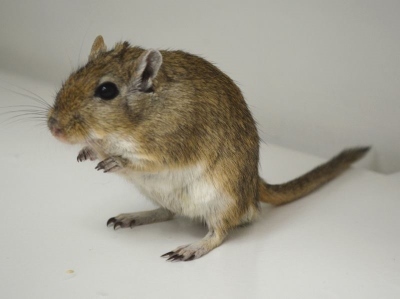 Mongolian gerbils have strong hind legs which help them jump away from predators. They can also escape via a “tail slip,” which means the fur and skin are torn off their tails as they escape a predator’s clutches. Mongolian gerbils use burrows in which to live, hide from predators and escape extreme weather. In the wild, they will dig in soil near plants in order to use the plant’s roots as a support system for their burrows. A Mongolian gerbil burrow typically consists of two or three chambers. One is used as a nest and the remaining chambers are used as storerooms. Mongolian gerbils will live in family groups. All family members will defend their burrow and contribute to food stores. Mongolian gerbils are slender rodents. They are smaller than rats, but a little bit bigger than the average mouse. With their tail making up about half of their total length, adult Mongolian gerbils can grow to a body length of 10 cms (4 inches) with their tails adding another 10 cms to their length. Males tend to be a little larger than females. Mongolian gerbils are completely covered in fur, including their tails which also has a soft tuft of fur on the end. Mongolian gerbils have long, narrow hind feet which make them strong jumpers. They also use their hind feet to thump the ground as a form of communication. They also have long claws which helps them burrow into the soil. Father Armand David of France is believed to be the first known European to document Mongolian gerbils during his travels to inner Mongolia in 1866. He called them “yellow rats” and sent some to the Museum of Natural History in Paris. Almost 100 years later in 1954, American Victor Schwentker imported several pairs of Mongolian gerbils into the U.S. from Japan, where they were being used for research. Schwentker established a colony of Mongolian gerbils in order to sell to biology labs. He found the gerbils to have a friendly nature and gave excess offspring to friends and family to keep as pets. Soon after, gerbils were sold in pet stores. Mongolian gerbils mark their territory by rubbing their bellies over the desired area. Both male and female Mongolian gerbils have an oval scent gland covered in short fur near their belly buttons. Mongolian gerbils — like other species of gerbils, but unlike any other type of rodent — can have epileptic seizures. As a result, Mongolian gerbils are used for research into epilepsy. As mentioned above, this is the second time we have featured gerbils as our Animal of the Month. Check out our blog post from March 2015 to see our tweets about gerbils the first time around!